Themes derived from conversations with three youth workers suggest that some youth workers experience a moment in their careers in which they come to believe that without them, their program would not have significant meaningful purpose for the youth participants. The following themes contributing to this experience were generated from the conversations: having a personal philosophy of what young people need; having knowledge of resources and experiences that may be personal and/or professional; perceiving organizational alignment with one’s own philosophy, and perceiving organizational support and resources for creating desired program outcomes. It is suggested that efforts to create meaningful outcomes for youth through youth programs may be more fruitful if there is a focus on developing youth workers” sense of ownership of the programs in which they work. This paper explores themes derived from conversations with youth workers in which we explored what good youth work is to them and how they came to be youth workers. The youth workers each work in a different community-based program and are active in their own professional development as well as in community collaborations between their own and other local youth programs. As a youth work educator and advocate, 1 became familiar with each of the youth workers through professional development events and collaborative projects, and asked them if they would like to participate in this exploration. The conversations occurred as one-on-one, open-ended interviews between myself and each youth worker, in their organizational setting. This exploration reflects work in the youth work field that has addressed meaning making (Garfat, 1998, Krueger, 1998) as a way to better understand youth work and its effectiveness. Meaning-making is considered a potentially rich avenue of inquiry in part because the ways in which youth workers make meaning of the work may provide insight and understanding about how youth work can be effective. As a youth work educator and advocate, I asked questions that relate to meaning-making with the bias that youth workers are often left out of program and outcome-creation discussions and decision-making processes. I believe that given the opportunity to become familiar with the language of program outcomes and the program and outcome design process, the tremendous potential value youth workers possess can be realized. Given this bias, I asked youth workers questions regarding their meaning-making with the assumption that this kind of accountability in youth work might be cultivated based on certain beliefs and experiences of the youth worker. I wanted to find out what kinds of beliefs and experiences would surface in conversations with youth workers. Essentially then, meaning-making reflects beliefs and experiences of the youth worker, which dictate practice and its effectiveness on an individual level. On an organizational level effectiveness may be dictated by the degree to which beliefs and experiences of the youth worker are congruent with and incorporated by the organization. The themes that were derived from the conversations may suggest ways in which organizations and youth worker educators can foster quality programs for youth that engage youth workers in program design in meaningful and supportive ways” They may also guide research that could further explore and establish how and whether “ownership” is fostered, as well as its relationship to accountable and effective youth work. Five themes emerged from the conversations: youth workers make meaning of effective youth work through perceived and real ownership of the program they work in; youth workers experience youth outcomes as something that youth perceive as meaningful; youth workers draw from specific experiences as a young persons and as youth workers to make meaning of youth outcomes and lastly, youth worker perceptions of organizational meaning and support are critical to the youth worker’s ability to engage in program design. These themes may be categorized as follows: personal meaning, personal support, organizational meaning, organizational support, and ownership. In general, the themes of personal meaning and support represent experiences relating to developing a conceptualization and philosophy regarding what youth work is and what youth workers do. The themes of organizational meaning and support represent youth worker’s perceptions about their organization's philosophy, either on paper or in practice, and the resources the organization provides that allow the youth worker to create meaningful experiences for the youths in their programs. The theme of ownership represents the experience of youth workers in perceiving themselves as the critical actors in creating meaningful experiences for youths in their programs. The theme of personal meaning reflects the perception by youth workers that the youths are acquiring meaningful experiences in their program. What is important to the youth worker is that the young person “feels” meaning through the experience of being involved in their program. Another aspect of this theme is the way in which youth workers know that meaningful experiences are being felt by youth. Finally, personal meaning reflects youth workers” understanding of how they create these experiences, such as by developing relationships with youth and thereby demonstrating that the youth worker genuinely cares about each youth. The next theme is personal support, which posits that youth workers draw from specific experiences as young persons and as youth workers to make meaning of what good youth work is. One youth worker remembers that he was beginning to get into trouble, or at least beginning to go down that path, when a coach started picking him up to work out at the gym. This youth worker mentions an adult who helped set him on a different path, which correlates to the following example of good youth work. A kid is on the threshold of being a gang member, or drug user, and I watch him flourish and become an outstanding youth leader. I done seen these kids like Roberto, he wanted to be the gang leader, and had 5-6 kids following him. In 6 months he was at the leadership conference we had presenting on making and selling flowerpots. I looked at other youth workers and what they did, for guidance and some did it well and some didn’t. Like when a youth worker I knew as a youth, you had a core set of people that loved working with kids He would take money out of his own pocket and let’s have a barbeque, things that weren’t for personal gain, at all. I wanted to model that and to model from other adults in my life. He worked at the teen center and everybody loved him It was just so amazing. He was just cool, he was stern at the same time, you knew that you couldn’t do certain things around him. He’s not gonna let you walk all over him. He had a culture where he was fun to be around and he wasn’t gonna take any bull at the same time. He was there and he was accessible. In some cases, youth workers cited examples of lack of personal support experiences, such as not having sufficient role modeling by an experienced youth worker. In one case an effective, experienced youth worker did work at the organization but was not able to provide the support required. Other forms of positive support included taking classes in youth work and having a supervisor who actively role-modeled fun, spontaneous interaction with the young people in their program. Personal support reflects how youth workers draw from personal experiences in order to build their beliefs about good youth work, but also to know how to act on those beliefs, or to know what is possible in youth programs. This is where youth workers witness and experience beliefs in action, often as the youth or the new youth worker. The immediate context in which youth work occurs is the youth-serving organization by which the youth worker is employed, and in which the programs commonly take place. In order to understand how youth workers are able to act upon and implement their idea of good youth work, the influences of the organization must be examined. Two themes address this context: organizational meaning and organizational support. Organizational meaning reflects the youth worker’s perception that their organization's vision of effective youth work is aligned (or not aligned) with their own vision. One youth worker related how she experienced organizational meaning. It makes sense, having a good youth worker that’s able to apply all these skills to get these outcomes. But a lot of times they don’t look at it as common sense because they aren’t looking at youth work. The youth worker is making these goals on their own, but they don’t want you to deviate from the plan. In this case, the youth worker has strong personal meaning and support, but perceives a lack of organizational meaning, which may prevent her from developing and implementing her idea of good youth work. Organizational support refers to the youth worker’s perception of resources that the organization provides so that good youth work can occur. The theme here was that, generally, resources were deficient and prevented the youth workers from establishing and implementing a vision for the program. In one case, a critical and deficient resource was identified - additional staff to provide more individualized attention and programming, such as with the following comment. I might interact with a group of kids here, but then I have another group over here that’s like well, Kerby lets do this, and I’m like hold on, or I–ll be there in a minute, but the minute doesn’t last that long. The final theme of ownership reflects the perception of the youth worker that they are the critical and even the sole adult responsible for making the program happen. Youth workers expressed a process of being a new youth worker and being satisfied with just having fun with and being with the youth. As they became more experienced, however, they realized that it is up to them to make meaningful things happen in their programs. At this point they felt personally challenged to take their personal meaning and supports and put them into action, utilizing if possible, the organizational meaning and supports to do so. This feeling of ownership seemed to occur even if the organizational meaning was not aligned with their own, and even if sufficient supports did not exist. These factors did seem to determine the degree of success that youth workers perceived they were having in creating meaningful experiences for youth, however. This theme is expressed in the following statement. The challenging part was just for me to realize like, right now, I carry the bulk of the pressure you know, I need to do that, you know, what can I do to get the kids to feel this you know... when it actually came on where I had a say-so about what was going on, I felt as though that I was the one that was really intrigued with the kids” process... so I started saying where is this program going, what can we offer them, so I started to reformat what has been out here and just started adding my little touch to it. Finding #1: Youth workers make meaning of effective youth work through perceived and real ownership of the program they work in. Finding #2: Youth workers experience effective youth work as so met hing that youth perceive as meaningful. Finding #3: Youth workers draw from specific experiences as a young person and as a youth worker to make meaning of effective youth work. Finding #4: Youth worker perceptions of organizational meaning and support are critical to the continuation of the me aning-making process. The five themes taken together suggest a set of relationships illustrated in Figure 1. 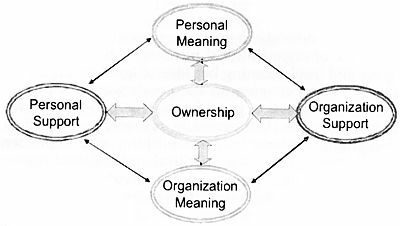 The theme of ownership is seen as the central theme around which each of the four other themes revolve. The meaning-making experience of good youth work seems to begin with the construction of personal meanings which are fuelled by personal supports. These interact and influence each other, but would not necessarily become articulated or evidenced in practice for the youth worker without the sense of ownership occurring. If a sense of ownership develops for the youth worker, an interaction of organizational meaning and organizational support experiences can act as a catalyst that allows the youth worker to translate his or her personal opportunities and supports into effective practice. This theoretical model suggests a general process and a set of factors by which a youth worker may become effective in his or her practice. To illustrate what this model suggests, let’s explore a hypothetical case. Say that youth worker Ernie takes a job at his local community center youth program. Ernie enters the position without a sense of ownership of the program but does have a sense of personal meaning and support regarding youth work. That is, he has no connection to the center or its youth, but he has some articulated beliefs and experiences about what effective youth work is. Whether Ernie is able to translate these beliefs and experiences into practice depends on Ernie’s perception of his organization's practices being aligned with and supportive of his own ideas of what effective youth work is. Let’s say Ernie finds his organization's executive director, supervisor, and co-workers to be supportive and in general agreement with his own ideas of what effective youth work is. Now Ernie has the capacity to implement his practice ideas. However, in order for Ernie to develop a sense of urgency and of leadership in developing his programs and activities, this model suggests that he needs to feel a sense of ownership of the programs. That is, he needs to believe that meaningful experiences for youth will likely not occur unless he creates strong programming. While there are certainly many other factors at work in creating effective youth work, the model presented here may be particularly helpful in understanding how to better cultivate effective youth work with our staff and in our organizations. It is hoped that this exploration might help to inform and generate research that reflects the current literature such as the post-modern and psychological theories of meaning-making (Bruner, 1990; Nakkula & Ravitch, 1998; Lather, 1997; Moustakas, 1994), organizational behavior, and change theory (Argyris 1999; Argyris & Schon, 1974), and theories of adult learning (Friere, 1972; Brookfield, 1990). Insight into any critical experiences or perceptions that have particular power in catalyzing youth worker’s ideas into action within their organizational contexts would have broad and important applications in the youth work field. Argyris, C. (1999). Flawed advice and the management trap: How managers can know when they’re getting good advice and when they’re not. Oxford: Oxford University Press. Argyris, C., & Schon, D. (1974). Theory in practice : Increasing professional effectiveness. San Francisco: Jossey-Bass. Brookfield, S. D. (7990). The skillful teacher: On technique, trust and responsiveness in the classroom. San Francisco: Jossey-Bass. Bruner, J. (1990). Acts of meaning. Boston: Harvard University Press. Freire, P. (1972). Pedagogy of the oppressed. Harmondsworth, UK: Penguin. Garfat, T. (1998). The effective child and youth care intervention. Journal of Child and Youth Care, 12(1-2). Krueger, M. (1998). Interactive youth work practice. CWLA: Washington, D.C.
Lather, P., & Smithies, C. (1997). Troubling the angels: Women living with HIV/AIDS. Boulder, CO: Westview Press. Nakkula, M., & Ravitch, S. (1998). Matters of interpretation: Reciprocal transformation in therapeutic and developmental relationships with youth. San Francisco: Jossey-Bass.